What are your favorite citation tools? 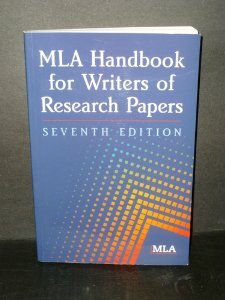 BACK IN MY DAY (cue groans) we had to use the print MLA manual to do our citations! Students these days have got it easy with their EasyBib and their RefWorks and their Zotero. A strange artifact found in the Weed pile. But seriously, what are your favorite citation tools? I think citations can be one of the hardest parts of student assignments, and that a lot of plagiarism could be avoided with properly attributed sources. Students are delighted when I show them the built-in citation makers in our databases. I was inspired this morning by a post over at the Unclutterer blog about Organizing References and Bibliographies. They only list the citation management tools EasyBib and CiteThisForMe. I admit I used EasyBib a lot in college/grad school. Here at ASU, we’ve got a subscription to RefWorks, which I’ve used a bit, but find the importing and tagging to be a little cumbersome. I know fans of Zotero, which is a free citation management tool, and Mendeley, which is free as well. Oh, and there’s EndNote, too, which I think thesis and dissertation-writers are a fan of, but I hear is pretty costly. ASU Libraries has this neat Library Guide to choosing a citation management tool. I found this helpful Citations and Bibliographies Library Guide from Neumann University that helps students identify the parts of sources for easier citation. And of course, there’s the Owl at Purdue, which got me through my MLIS. What are your favorite tools and what makes them great? You’re probably heard the advice to promote yourself on social media. That sounds an awful lot like work! But what if I told you that getting ahead in your career could be a delightful side effect of having fun on social media? I’ve had incredible conversations with people I’ve never met IRL. When you share your passions online, you’ll find a whole community of like-minded individuals – and one of them might just help you get ahead! Suzanne Lucas, aka Evil HR Lady, says that Twitter is your friend, and shares a story of someone that landed a job through Tweets. She suggests live tweeting events – which is FUN! – and also gives you visibility in connection with the event you’re Tweeting at. Be sure to use hashtags! She also recommends not being shy – Twitter is wide open and you can talk to anyone! US News has a piece on using social media to improve your career. If you don’t have a LinkedIn account – you should definitely create one. LinkedIn has some interesting special interest discussion forums and you can apply for jobs directly through the site. You can also research the next step for your career by looking at how others have progressed. Their top advice is to be yourself – and to participate in discussions! It’s fun to debate issues with other people online. This About.com page has a lot of great resources for more in-depth information on how to use individual social media services to improve your online presence. My advice? Get out there, conquer the learning curve of a new social media site, and remember to have FUN! Great things will follow. Today I offer you a guest post from AzLA attendee Patricia Watkins, who is a Research Librarian and Information Resources Coordinator at Embry-Riddle in Prescott. She shared her notes from the presentations she attended. Key: Making sure the apps are a seamless operation, secure, and supported. Chrome browser – Customizable, fast. Runs Java script, smoother than other browsers. .. Clean on a smartphone, accesses all bookmarks … Takes place of De.lic.ious … Firefox now has bookmarks … Google Drive: now loads your docs to the cloud like Dropbox. Dropbox – Hard drive in the cloud, get 3g in the cloud, easy to upload images, etc. Subscribe to Gizmodo for updated tech info and new apps … MCLC Tech Talk technology interest group for librarians in Maricopa county. I’d like to throw in my endorsement for Dropbox in particular – you can work on your files anywhere and it syncs automatically. I’m also a big fan of WordPress as a web platform and for Chrome as being an easy, customizable web browser. Also, still waiting on word when AzLA presentation slides will be uploaded. Hoping soon! And I’ll let you all know. The teacher ran the paper through one of the commercially available online programs designed to catch plagiarism, and part of one sentence popped up. She insists he copied the sentence from some book published in the 1950s and expects him to cite his source. The parent argues that she walked the student through every step of the essay writing process and that no plagiarism occurred – that it’s mere coincidence that part of one sentence just happened to match the 1950s book. [Y]ou need to be practical. If teachers use these online programs to check for plagiarized phrases, it makes sense for students to double-check their papers the same way. Annie gave some solid advice: use the same tool as your teacher to make sure you don’t get pegged for plagiarism. Clearly college students have a culture all of their own, and educators aren’t going to be able to change that without student buy-in. But why can’t we be more creative in the assignments we give students? Students copy and paste for two reasons, in my unscientific opinion: First, because it’s easy, and by pre-emptively running it through something like Turnitin.com, they can get away with it. Second, they plagiarize because their creative online activities generally center on re-using or re-appropriating someone else’s content – and fresh content is extremely accessible. They’re spending their free time connected to the internet and they’re doing amazing and hilarious things (just see Tumblr f0r good [and bad] evidence of this. But when it’s good, it’s gooooood). I think the current education system enables plagiarism by continuing to emphasize essays as the default demonstration of content mastery. This is an assignment format that is extremely susceptible to becoming copy-and-paste masterpieces. Students have always plagiarized – it’s just much easier now. So let’s let students put their online creative urges to academic use by coming up with new ways of assessing their mastery of course content. How about more presentations – but NOT with PowerPoint? Have you tried Glogs or VoiceThread? How about more group work with deliverables that mirrors what they’ll have to do in professional jobs? How about letting students come up with their own ways to show you they understand the course, without rigidly forcing them to produce 1000 words on the subject? Let’s make assignments more interactive and more reflective of the culture that students and professional workers actually live in. Good writing skills are very important. But so is getting students engaged in the material they’re supposed to be studying. I bet, like me, you do your best work on subjects and mediums that are most engaging for you. What do you think? Got any creative ideas for tackling the culture of plagiarism? Google Reader dies today. Don’t lose your favorite feeds! If you use Google Reader and you haven’t switched, you’re down to the wire! The Google service ends today. But fear not – I offer up a collection of links with alternatives below! If you have no idea what Google Reader is – it might be time for you to read up on feed aggregators! If you visit a lot of sites daily just to see what’s new – you might want to switch to an aggregator, which will collect all of your sites’ updates for you in one place. Aggregators put all your new blog posts and news articles in one page for easy viewing. (Or, anything with an RSS feed, at least, like this blog! ; ) Here’s an overview of RSS feeds for newbies. Ask A Manager: All of your work and job searching questions answered! iLibrarian Blog from OEDb.org: Lots of tech tips for library-types! What blogs do you follow? Have you heard of If This Then That (IFTTT)? It’s a social media mash-up tool that lets you conveniently automate online tasks! Library people love information, so email yourself “10 Things to Know This Morning,” every morning! Text yourself the weather every morning too. (Spoiler alert: it’s always sunny in Arizona.) On a tangent: No word yet on University of Arizona’s dust storm app for Android, yet, but it is available for iPhone! Does maintaining multiple library social media accounts get you down? Make it a little easier by syncing your Facebook profile pic with Twitter! You can also tweet whenever you post a new link on Facebook. Automatically download photos that your institution is tagged in on Facebook to Dropbox! Tweet your WordPress blog post! Let your Twitter followers know whenever a new post is published. Heck, let your Facebook followers know too. Committee meeting running too long? Text to escape! Send IFTT a tagged SMS and you’ll get an “emergency” call. The emergency is up to you! And finally, alert your Twitter followers to the zombie apocalypse. Just in case they’re not at the library, where they’re supposed to be!